To enhance the existing Project and KPI features we are soon to be introducing a 360 KPI facility; helping to efficiently monitor, measure and manage performance. 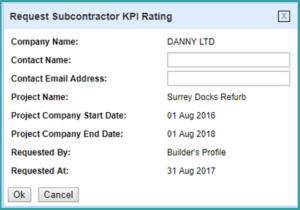 Once your performance criteria is configured into the system, it’s so easy to ‘Request a Rating’. Choose the Subcontractor attached to the required Project, specify the contact name and email address and the request is sent. 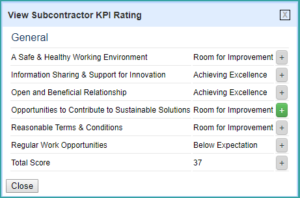 Once the rating has been submitted, the criteria rating and comments are easily viewed by relationship, company and project. For reporting purposes, comprehensive rating analysis can be carried out. This is just a brief overview of the feature. The full feature is fully configurable to to suit your requirements. Main Contractor Services can help and advise how best to implement the service.